You would think after all these years, TransLink would have been shaking out the bugs out of their system, but the answer seems to be no. On Monday morning (my furlough day), I went to downtown for a little walking tour and went to the add value machines at Montgomery station so I can purchase the March "Muni only" $60 pass (aka "M" pass) for the month of March. Strangely, the options on the machine only allowed me to purchase the higher priced $70 pass (aka "A" pass). I removed my card and used the second machine to find out if it's just a machine problem, and I got the same options. So I gave TransLink a call to tell them about the issue and they suggested I go to another station. At Powell station, I tried again and got the same problem. I gave another courtesy call to TransLink and explained that this is the third machine in two stations I've used and it didn't give me the "M" pass option. They even accessed the machine remotely to see what steps I'm doing to purchase a pass and they saw it for themselves that there was a big problem. After they admitted that it was a problem, they took my phone number so they can call me back on updates. They have called me back a couple of times to inform me they are still experiencing problems. Just about 10 minutes ago, I called TransLink for some answers, and they continue to have issues with the automated add value machines and encouraged me to visit a retailer. I told them I have a commuter benefits debit card and I can only use it at automated machines or on the TL website. I prefer the automated machines because it's an instant purchase and my information is updated instantly. This is a really strange issue that the "M" pass is not showing-up as an option to purchase. There's less than a week remaining and people want to buy their passes at the automated machines. I haven't experienced an issue to buy the "M" pass for January and February; but now there's a problem? Just to make people wonder: TransLink was at the Montgomery station not long ago giving away free cards because SFMTA decided to remove the pass sales booth, and it was to encourage people to use the cards and automated machines to buy their next pass. Well... um... not showing the "M" option on the machines, shines a bad light on the universal transit card. "These passes will be available on AVMs as of the first of the month for those who have an existing Muni-only pass on their card." 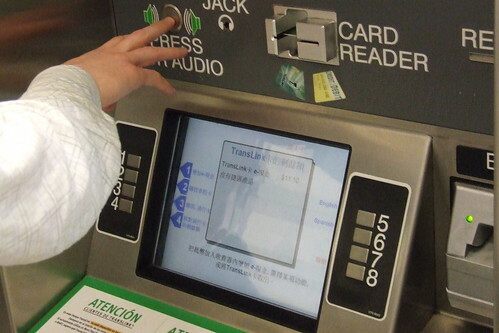 "Customers without a Muni-only pass on their card can purchse one now from an AVM. We're working on syncing up the timing for both"
I have the benefits card with the Mastercard logo on it. Are you not allowed to add value to the Translink at Walgreen's? I always use the automated machine so I haven't tried. Great question. If you have a commuter benefits debit card, you cannot use it at just any retailer. It has to be a vendor that ONLY sells transit media. Places like Walgreens and Safeway is a big no. It's accepted if you do it on an automated TL machine. "This card can be used at Transit Agencies or designated transit retail centers where ONLY transit passes, transit tickets, fare cards, and vanpool passes are sold, as well as at participating parking providers (if you have the Personalized Commuter Check Card for Parking)." This is what happens when you have people fiddling at the margins and not realizing the real-world impact of their decisions. Likewise, the decision to eliminate people selling passes, etc downtown and pushing them off on to retailers - retailers who CAN NOT TAKE Commuter Checks, etc. It made sense on paper and hey let's fire some people and look good. And now the whole thing is a big ball of FAIL. They should have just split the difference, kept one price (heck split the difference and charge $65) and not screwed around. They're not saving any money and they're just making a poor system more complex with no real benefits. BTW, you are doing a great job keeping on top of Translink stuff. Keep up the good work! It's also frustrating that Muni doesn't maintain a list of places on their website about who will take Commuter Checks and their debit cards. I know the SFMTA Customer Service center and SFSU's student center accepts them.